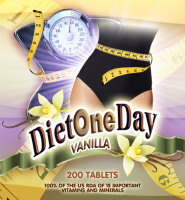 DIET ONE DAY TABLETS are available in day packs or full bottles. Day packs let you try different flavors in a smaller size. Flavors available at this time are Butterscotch and Strawberry. Soon to be available in Chocolate and Vanilla. Order yours today. Suggested usage is 20 tablets per day. Day packs contain 14 tablets per pack.